Electronic music production has changed a great deal in recent years due to newer technology. One of these types of new technology comes from the team over at Novation with their Launchpad Mk2 model. In most cases, this pad based midi controller can be used for finger-drumming or DJ-ing, inside the studio and live on stage. 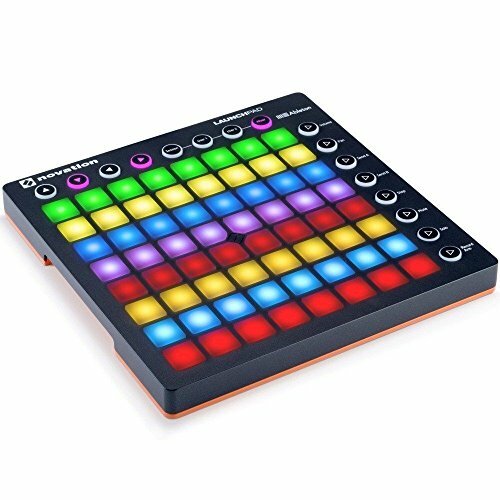 The Launchpad Mk2 can transform a boring studio session into a journey of unique sounds, samples and songs at the push of the button. In this Novation Launchpad Mk2 review we are going to dive into the pros and cons of this midi pad controllers and see if it is the right fit for your style and studio pleasure. This Novation Launchpad Mk2 Review closely examines the many features of this model. It does include the Ableton Live Lite DAW, which makes it a nice addition to any sound package. At the same time, it can plug into most computers by simply using a USB cable. However, this cable is a bit short for some people’s liking, so it might need to be replaced with a longer cord as needed. It also comes with 64 RGB light ups to match the colors of clips being played or recorded. This feature allows people to take a single glance at the Launchpad to determine what lines play and which ones do not. This product focuses on pairing up with the Ableton Live software provided for the computer. Through this software, pre-laid tracks can be modified to add various instruments, including drums. As mentioned previously, the back of this model includes a non-slip or non-skid covering. Therefore, Producers and DJs can perform their music without worrying about this item slipping around on the table. Even when extra force applies to it, the Launchpad Mk2 will not move around easily. The table beneath it will shake around before this item moves. The Launchpad Mk2 includes higher quality materials than the previous build. Buttons have been made with more durability and less clicking noises, which means they will stand up longer than those on the previous model. Novation also includes more colors on this build, up to 64 in total to be precise. The previous model, the Launchpad S, did not have nearly as many colors to work with. Once more, Novation provides a product that is extremely easy to use. People do not have to perform any elaborate programming when it comes to syncing the Launchpad Mk2 up with the Ableton Live software package. This software easily installs on any computer. Therefore, when the USB cord used to connect the Launchpad Mk2 into the computer completes the connection process, plug-and-play technology comes into play. Some people have experienced a few problems with this software syncing to the Launchpad itself, but these problems are few. They certainly do not occur as often as they did with the Launchpad S.
Since the buttons are not velocity base, the lines of music connecting to them change a lot faster. Again, this benefit out does the Launchpad S.
Additionally, the Launchpad Mk2 comes with a lot of upgrades from the previous model just for a little bit extra in cost. 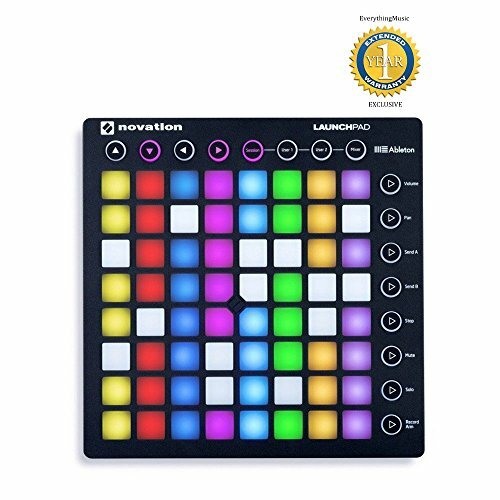 The Launchpad Mk2 is not the only RGB pad on the market today.There are a few, different items to pick from. Here is a closer look at some of the comparable items to this Launchpad model. Since the Launchpad S has been mentioned several times, it only makes sense to take a closer look at it in detail. Like the Launchpad Mk2, it will connect with many types of computers, including both Mac and Windows models. However, Ableton Live must be upgraded to version 9.2 or greater for the sake of compatibility. The Camera Connection Kit and Lighting to USB Camera Adapter are required for this model to work, but they are not included. The Launchpad Mk2 does not need either of these items to work as it simply plugs into a computer using a USB cord. Before the Launchpad S and Launchpad Mk2 came the Mini Mk2. This model works great for people wanting to learn how to use these items without having to deal with a lot of higher technology components. It does come with a 64 grid, but it does not include nearly as many colors as the Launchpad Mk2. Similarly to the newer model, loops can be started and stopped with the press of a button without changing around the grid too much. It still allows the chance to make amazing light shows to upload on video sharing sites such as YouTube as well. However, this model does not offer all of the same features as the newer model. One of the cheaper brands out there for controllers comes from Midiplus. This Smartpad also works with Ableton Live, just like the Novation models. However, the software is not included with the package, and connecting to it with this controller can be more than a little difficult. On the other hand, it will also work with Studio One products. This model works great for beginners looking to learn how to use these controllers, but it does not meet the demands of more experienced users. On the other hand, it does operate on a USB cable with plug-and-play technology similar to the Novation models. Another problem with this model lies in the fact that it can only be used to pre-recorded music, so it will not work for live shows.